The purpose of the resume is to make a strong first impression, by highlighting your most relevant skills, experience, and knowledge. It should be impactful, concise, and provide your reader with a clear message as to why you are qualified for the role. Hiring managers scan hundreds of resumes for each job description, and no one wants to read a document full of nondescript adjectives and verbs. So choose powerful, descriptive words to boost your resume. “Dedicated” and “results-oriented” are phrases that most people use to describe themselves, and hold no weight from a hiring perspective. Chance are, you can name 10 people who possess similar qualities and also enjoy seeing the positive results of their hard work. Though the point isn’t to write an exhilarating action novel, you should talk about your career, your experience, and your value in an interesting and impactful way that uniquely describes you. It’s easy to fall into the trap of overusing common phrases such as created, developed, managed, handled, coordinated because they mimic the way we speak in everyday conversations. After multiple uses, they start to lose their integrity, and candidates sometimes try to work around the scenario by defaulting to overly-wordy phrases that say the same thing in a more drawn out way: “Was primarily responsible for the development of…”. Take a look at the verbiage you use to describe your responsibilities, impact, and qualifications, and ask yourself if there is a choice that sounds more powerful/high level/interesting/etc. Use to: Convey the idea that you created something that was new and successful, whether that’s a process, guideline, workflow, or product. Use to: Convey the same ideas as the words above, but that in doing so you created greater efficiency or a similar positive impact. Use to: Show how you put specific knowledge or skill sets into use to achieve a desired result. Use to: Communicate the idea of relationship building from a more strategic angle. Use to: Present supporting information around areas in which you have experience or knowledge and want to emphasize. The quality of language and content can make or break your resume, profile or cover letter. Boring repetitive language will fall short of effectively marketing your key points, while excessive, complex, or drawn out ideas and phrases will sound artificial and like you’re filling space. The key is to remember that less is often more, and using colorful and descriptive words to communicate your ideas will create a more impactful message around your unique value as a candidate. 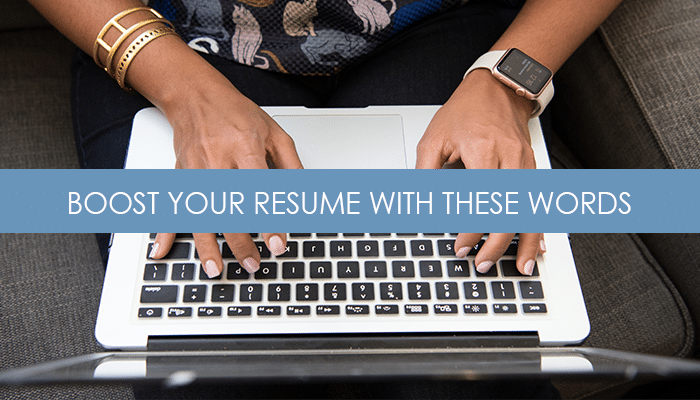 A keyword optimized resume will ensure you stand out in today’s ultra-competitive job market. Learn about our resume and branding services. Tags: branding, career, communication, job search, marketing, resume, writing. Bookmark the permalink. I definitely think a thesaurus comes in handy when using words to more accurately (and creatively) tell your story. A resume is a marketing piece about you and it should show off your talents and skills in a way that gets you noticed. Word choice is a key player in that marketing. Thanks for sharing.